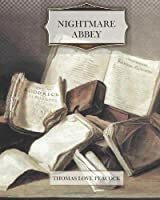 We don't have a description for Nightmare Abbey, but if you head over to Amazon they'll be able to tell you what this book is about! I like Edgar Allan Poe more. I found this somewhat regular. I enjoyed the prose most of the time but I found the extended speech sections a bit boring. Overall not bad though! An interesting read and very much a product of its time. This is probably the challenge in that it possibly requires a greater knowledge of those times than I possessed to appreciate some of the humour in its carictatures. Yet despite this, there are moments of genuine laughter.